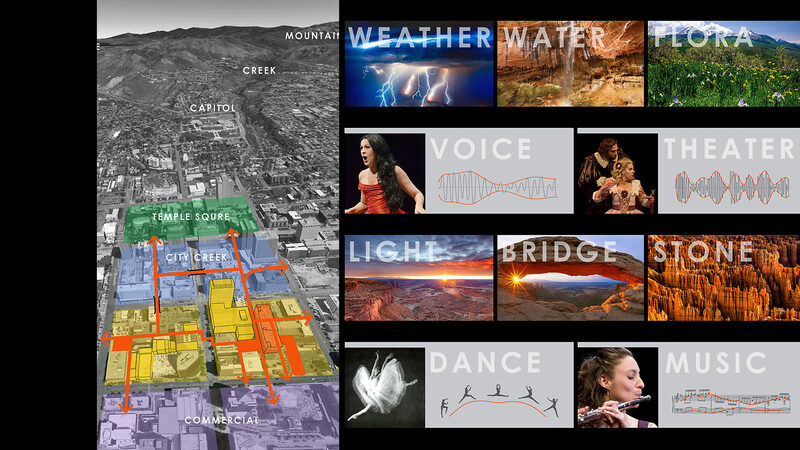 Place-making and the arts: the interstitial spaces. 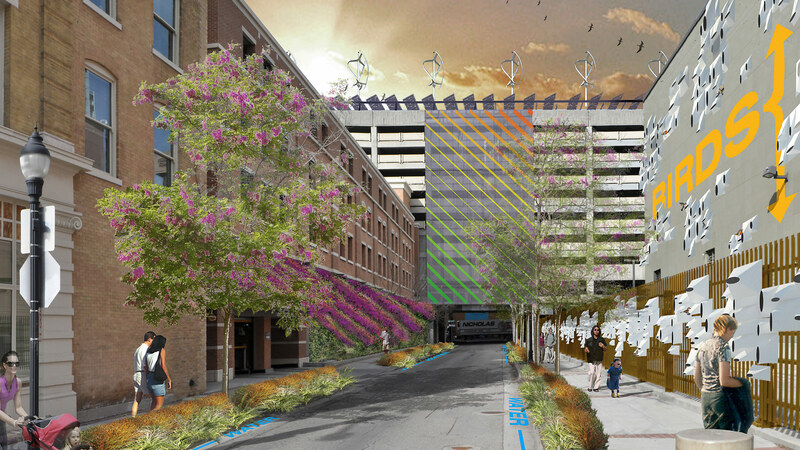 This competition proposal creates a design vision for the interstitial spaces on two city blocks in downtown Salt Lake City. The history of Salt Lake City is rich in utopian ideals, natural beauty, and the freedom of life in the west. The convergence and overlap of these elements has shaped the place since its founding. Centrally located between retail and commercial centers and adjacent to the Salt Palace Convention Center, Blocks 69 and 70 are home to a variety of existing and planned arts organizations and facilities. The urban fabric is spotty and eclectic, with an array of older and newer buildings in varying degrees of utilization. At more than 700 feet on each side, the blocks are also super-scaled and spatially incoherent with many interstitial passages and under-utilized spaces. 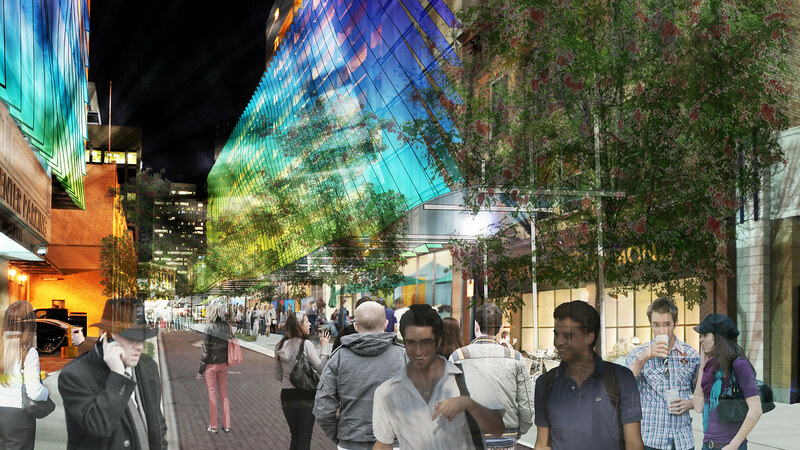 The development of this new District as the cultural center of the city represents an important next step in the growth and vibrancy of the downtown core. 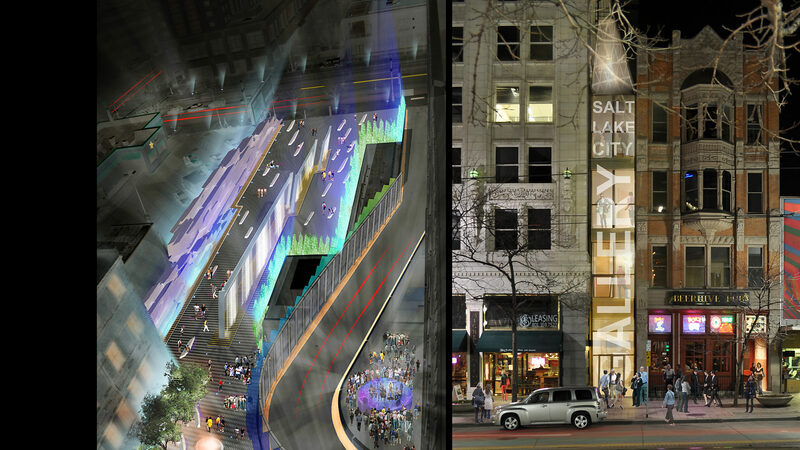 OFFICE 52’s design draws upon two themes that have shaped Salt Lake City since its founding. The first is the natural beauty of the place; the color and light of the desert, mountains and sky; the dramatic landforms, weather, water and the flora. These elements permeate the city and are a constant reminder of the overlap between the natural environment and the rugged idealism of the place. The second theme draws from the arts themselves. Central to the development of these two blocks, our design looks to aspects of the arts for inspiration: the movement of dance, the melody and rhythm of music, the cadence and inflection of the spoken word, the presentation of drama and the visual arts. 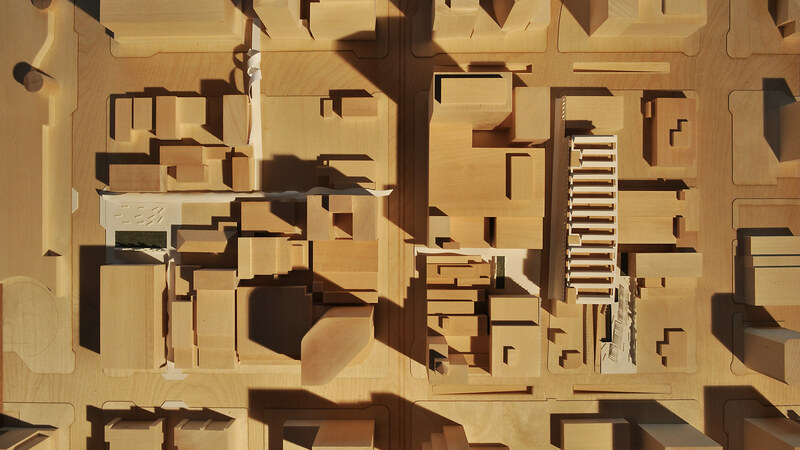 The design weaves these themes together in a unified architectural language that ties together the existing interstitial spaces of the two blocks through interventions, re-purposed spaces and modifications to existing buildings. Components of the design operate as changing venues based upon their program and use. 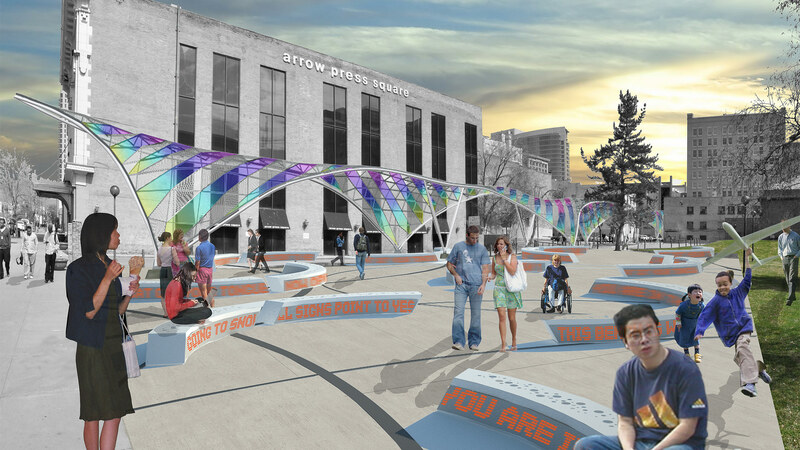 These interventions include the re-imagination of a forgotten open space at the base of large civic parking structure on Block 70 as a venue for music and other performances. The garage itself is re-clad with PV’s and wind turbines as part of a separate project for a new performing arts center to be built next door. In another area, vertical gardens and urban habitats are created to bring closer the contrast between the city and its natural environment. 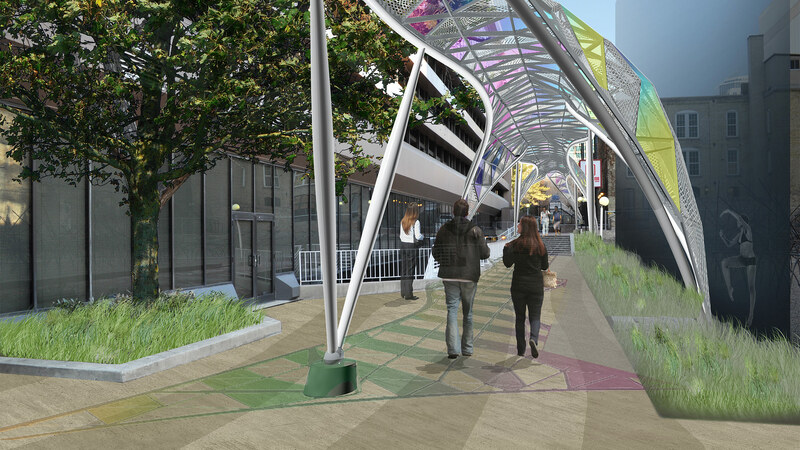 On block 69, adjacent to the Convention Center, a plaza is reinterpreted to create a gathering space for families. 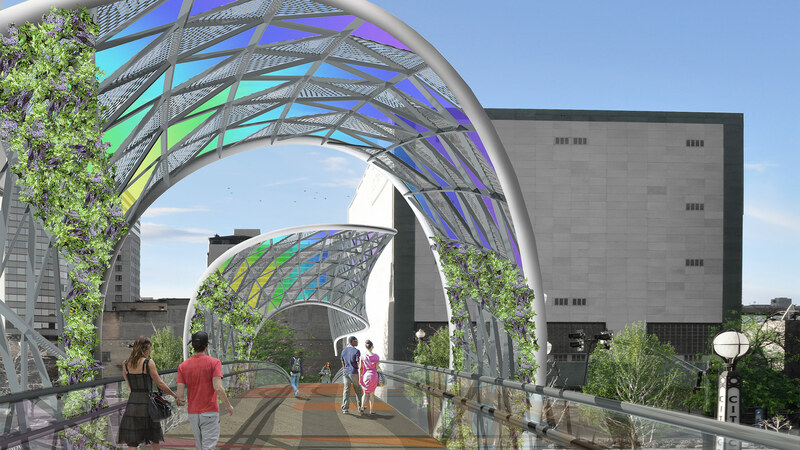 A narrow building on Main Street is re-developed as a Community Arts Center and Gallery, and a new pedestrian bridge is planned that will link the blocks to a retail center across a busy thoroughfare. These interventions are united by a common language of built form, materials and landscape to create pedestrian scaled places and linkages between the blocks, centers of art and creativity, and neighboring areas of the city. OFFICE 52 teamed with Bionic Landscape of San Francisco for this project.